Cloak and Dagger posing as partygoers and staking out a meeting of crime lords. Cloak & Dagger’s first season featured a grand, but predictable, comic book-y plot, but the real draw of the show was the thoughtful characterization that came from the time the series spent focusing on Tyrone and Tandy’s lives as “regular” young people. Despite their racial differences and disparate economic statuses, they were both struggling to find their way through a world trying to hold them back. In the season two premiere, Tyrone ends up almost being killed while robbing a drug house to provide evidence to the police, and Tandy inadvertently makes the life of an emotionally abused woman more complicated and difficult when she tries to get involved. Initially, neither of them is open with the other about their extracurricular activities, and learning the truth hurts them both because, on some level, they understand they’re far better off as a team. It’s the kind of realization that any good group of superpowered friends patrolling for crime would come to eventually, but with Cloak & Dagger it feels much more like another reworking of Tyrone and Tandy’s dynamic in Marvel’s comics, which was infused with problematic racial overtones. 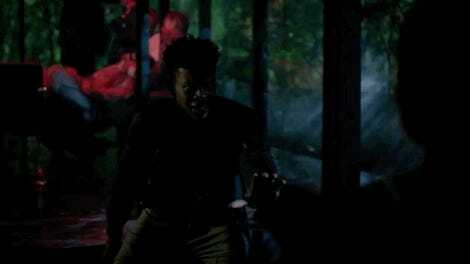 Rather than framing Tyrone as the embodiment of addictive darkness who relies on Tandy’s light to stave off his internal demons, Cloak & Dagger’s second season opens up with the idea that both kids are dealing with the damage that can come from pulling too inward on yourself—or losing complete control and acting out without thinking. But Cloak & Dagger is still a Freeform cape show, which means that it’s got to spend at least some time setting up this season’s larger villain conflict, and the first episode does it carefully with the return of detective Brigid O’Reilly (Emma Lahana), who’s suffering from the trauma of having seemingly died during the first season. In the final moments we saw of O’Reilly last time, she was emerging from the swamp after having been exposed to both the Lightforce and Darkforce and then being shot, meaning that it’s only a matter of time before she gets ahold of her own newfound powers and becomes Mayhem. Cloak & Dagger airs Thursdays on Freeform.